I dare you... Ask anyone, at any given time, "what would you rather be doing right now?" and I bet the answer is somewhere along the lines of a living postcard. Hear the palm fronds swaying and subtle crash of waves against ultra fine white sand. Under any other circumstances I'd be painting a picture of beautiful sunny Lighthouse Point, FL, where J.R. Dunn Jewelers is nestled away; but today I'm talking about a place commonly referred to as paradise: Bali. Time honored craftsmanship is a unique skill-set of the region. A tradition of jewelry-making has been passed down from generation to generation. This is where it all started for renowned jewelry designer John Hardy. John Hardy jewelry has been graced with a taste for radiant, sculpted jewelry, from contouring precious metals to the patterning of alluring stones. Each and every John Hardy piece is artisan-crafted in an eight-step process using fine jewelry techniques descended from the jewelers of ancient Bali's royal courts. Dramatic earrings, rings, necklaces, bracelets, cufflinks are all brought to life brilliantly from sketch to completion by the artisans of John Hardy. Each distinctive collection evokes an emotion, a symbol of honor and the creative transmission of energy from the craftsman to the wearer. John Hardy jewelry is more than ornamentation; it is a connection to an eternal source of inspiration, beloved by seekers, explorers and storytellers. 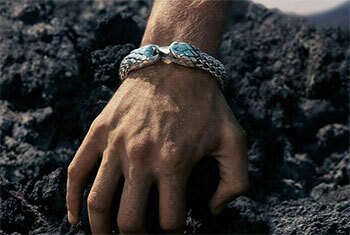 We are proud to showcase the hand-crafted collections of John Hardy jewelry right here on JRDunn.com. With a few clicks, you can be wearing a unique piece of jewelry that is infused with both meaning and tradition.